Trawlers Midwest is the U.S. sales rep for what, by every indication, is a capable 18-knot, 33-foot semiplaning inshore cruiser built of aluminum. The Eco-Trawler 33 has a slender hull that minimizes resistance at its 13- to 15-knot cruise speed while producing a ride that benefits from its slice-and-dice hull form. The buttocks sweep up in the aft 20 percent of the hull, so the boat will tend to squat a bit above 20 knots. And you won’t get good results by simply giving it a bigger engine; this is a committed semiplaning hull form, appropriate to its intended speed range. 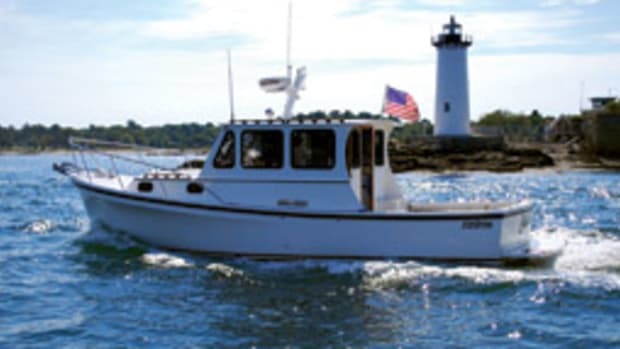 The brochure says it takes 10 hp to make 7 knots and 60 hp to reach 12 knots, which is plausible for a slim 6,000-pound vessel with an 8-foot, 6-inch beam. At 6,000 pounds, plus another 2,000 pounds for a trailer and gear, you’ll be able to tow this boat with a Suburban-size SUV or 3/4-ton pickup. Don’t expect the interior space of a typical 33-footer. 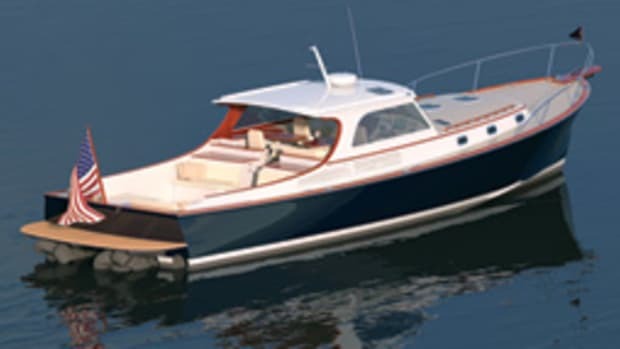 This 33 will have the interior space of a more conventional 29-by-9-foot-6-inch boat. 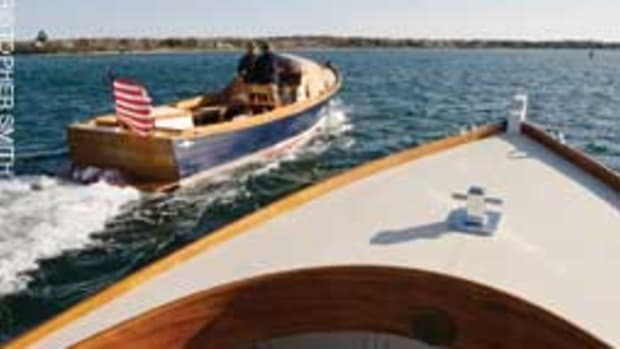 But it will also run at 15 knots with a good deal less power, less bow rise at the hump and a gentler ride in a chop. 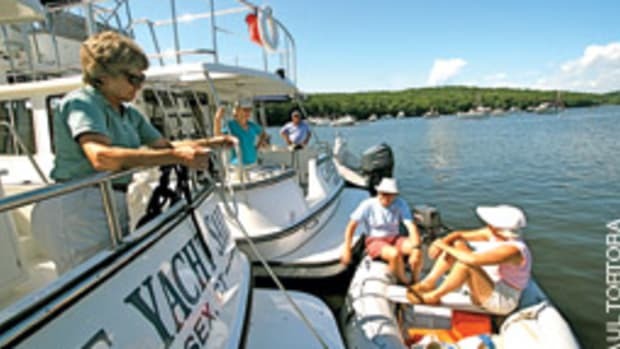 One reason boats have gotten shorter and wider is that these proportions yield more useful interiors, so decide which set of attributes is more important to you. 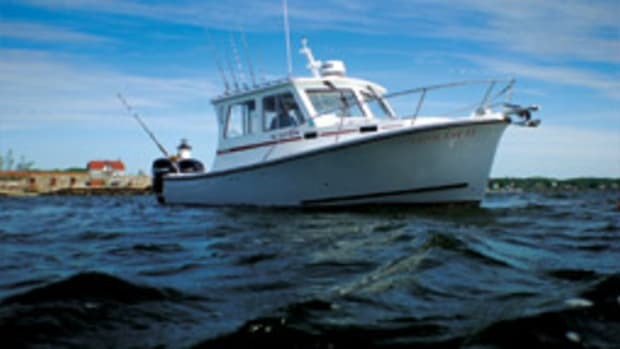 I find it helpful to think of a boat such as the Eco-Trawler 33 as a more comfortable 28-footer with similar beam but greater length on the waterline. 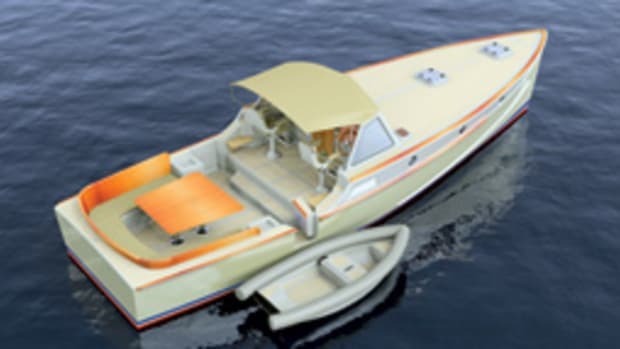 This is a semicustom design, so you start with the Don O’Keeffe-designed hull, lay out the interior and power it the way you want — outboard, sterndrive or inboard. The key to this trailerable boat’s success is keeping the profile — and center of gravity — low. The nice thing about sitting low in a boat, near its natural roll axis, is that sideways (lateral) accelerations are barely noticeable as it rolls. Up on a tuna tower you’ll feel the opposite effect as you are whipsawed from side to side. 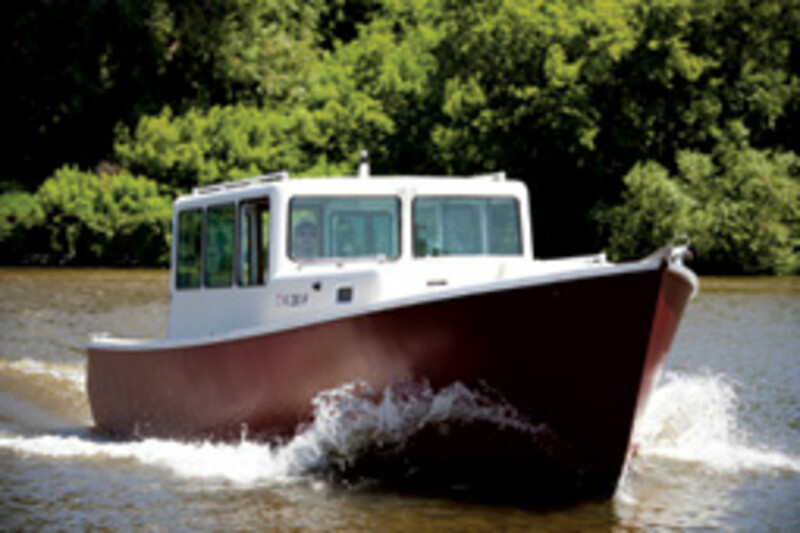 What’s somewhat unique about the Eco-Trawler, aside from its design speed and proportions, is its aluminum construction. Aluminum is tough, easy to repair and easy to maintain. 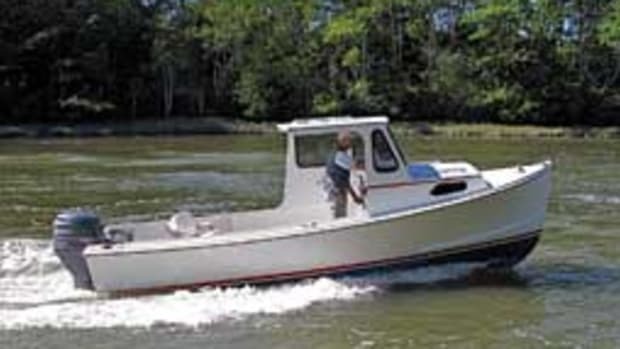 The exteriors of many commercial aluminum boats aren’t even painted, which reduces maintenance to practically zero. Of course, the tradeoff is that a boat finished in weathered aluminum isn’t even a little bit pretty to look at, so most pleasure-boat buyers opt for a paint scheme that dresses it up and gives it some personality. The bottom obviously has to be painted if it’s left in the water. Outboard power isn’t a bad way to go with this boat. The engine is isolated in the stern, which makes it quieter inside the boat. No through-hull fittings are required, so there is less opportunity for an accident to flood the hull. Four-strokes are very quiet and, for a gas engine, economical, and they last thousands of hours. You can go with a small diesel, which will deliver better fuel economy, though at greater cost for the engine and drivetrain. A conventional inboard is an ideal choice for a boat that operates in this speed range. 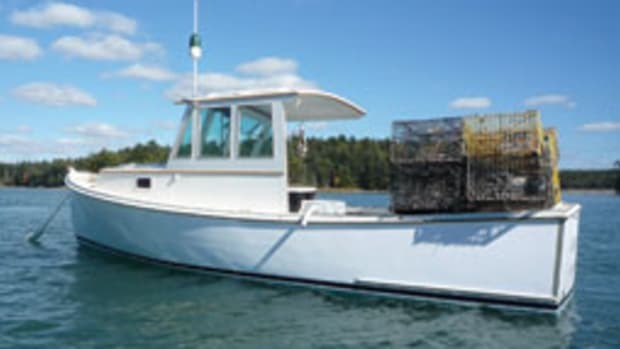 The added weight of the engine low in the hull increases stability and makes her sit a bit lower in the water for added comfort. Still, an outboard is a compelling power choice since you can also beach her. I have not been out on the Eco-Trawler, nor have I seen the bottom, so I can’t comment on its seakeeping. A slender hull form is usually very smooth-riding. If improperly proportioned, however, the boat can be squirrely down-sea. Be sure to take it for a ride if you’re considering a purchase. This is not a heavy-weather bluewater cruiser, but it should do well when run in appropriate conditions. Visit www.trawlersmidwest.com for more information.